Distribution and habitat: Euphorbia milii is a species of flowering plant in the spurge family Euphorbiaciae, native to Madagascar. It is a succulent climbing shrub with densely spiny stems. 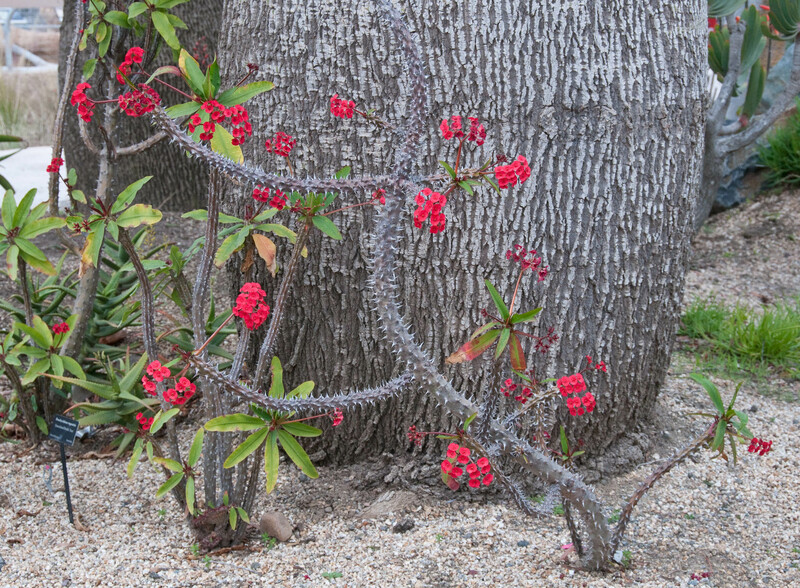 The straight, slender spines help Euphorbia milii scramble over other plants. The leaves are found mainly on new growth and are obovate. The flowers are small, subtended by a pair of conspicuous petal-like bracts, variably red, pink or white. Description: Euphorbia milii is a dense shrub up to a metre (3 feet) or so tall, it has 2cm (0.8 inch) tick dark brown stems armed on all sided and at frequent intervals with sharp spines of varying length (mostly around 1-2cm (0.4-0.8 inch)). Clusters of bright green, elliptic, 5-6cm (2-2.4 inch) leaves, which are produced near the growing tips of the stems, last for at least several months before dropping off, leaving the plant’s spiny stems permanently bare. Old leaves are not replaced and new ones will appear only on new terminal growth. The flowers are tiny, but each is surrounded by a pair of 2cm kidney-shaped, bright red bracts, which look rather like petals. Clusters of from two to six of these paired, flower-like bracts appear on 5cm (2 inch) stalk at the ends of actively growing spiny stems. They are not produced on the old stems. A sticky substance on the flower stalks adheres to the finger if touched. The main flowering season normally last from early spring through late summer, but flowering can be continuous if plants get exceptionally good light. 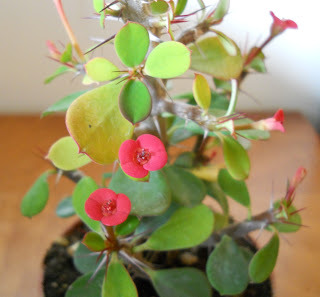 Houseplant care: Euphorbia milii does not require too much care but as Euphorbia milii is one of the spiniest plants, be particularly careful when handling the plant. Euphorbia milii is not fast growing, so pruning is usually not necessary until the second or third year. Pruning is best done during cool, dry weather in late spring to lessen the risk of stem disease. Remove only dead and overly tangled stems. Light: Euphorbia milii needs all the sun it can get. The brighter and more constant sunlight, the longer its flowering season will be. Temperature: Warm rooms and dry air normally suit these plants, through they can, if necessary, tolerate temperature as low as 13°C (55°F). If the air becomes any cooler, the leaves are likely to begin falling prematurely. Watering: Water plants grown in normal room temperatures moderately, enough to make the entire potting mixture moist, but allowing the top couple of centimetres (0.8 inch) of the mixture to dry out between waterings. After the main flowering season ends, give to plant a little less water; and if the temperature fall below 16°C (61°F) for long time, let the top half of the mixture dry out between waterings. Never let the roots to dry out completely as dry roots can cause premature leaf-fail. Fertilising: Apply week liquid fertiliser every two weeks from the late spring to early autumn. If plants are in such an ideal condition that they will continue to flower during the winter, feed them once a month. Potting and repotting: Use a combination of two-thirds of soil-based potting mixture and one third of coarse sand or perlite for good drainage. Move the plants into pots one size larger in early spring every second year. Older plants which have reached maximum convenient pot size should be top-dressed annually with fresh potting mixture. It is essential to pack the mixture firmily around the roots of the plant when potting Euphorbia milii. Gardening: When grow Euphorbia milii outdoors, choose a sunny, well-drained planting site. This plant will tolerate a few hours of shade during the hottest part of the day but does require sunshine for at least two-thirds of the day. Soil drainage must be excellent or the plant will develop root rot, fatal for plant. Add soil amendments, such as compost or peat moss, if the soil is sandy or of poor quality. Dig a hole for each plant as deep as the root ball and twice as wide. Space plants 0.5m (2 feet) apart to ensure proper air circulation. Carefully remove the plant from its container and inspect the roots. Prune away any broken, shriveled or mushy roots, then gently loosen the soil around the outside of the root ball with the fingers. Set the plant into the planting hole at the same level as it was in the container. Backfill around the roots with soil, pressing firmly with the hands to remove air pockets. Water around the base of the plant to settle the soil; keep water off the foliage. Water newly planted Euphorbia milii often enough to keep the soil slightly moist. The plant has established itself when it start new growth. At that point, water Euphorbia milii only when the top 3cm (1 inch) of soil is dry. Propagation: New plants can be raised from short tip cuttings taken in spring or early summer. Use a sharp knife or razor blade to cut off growing tips 8-10cm (3-4 inch) long and stop the latex flow immediately by spaying the old plant and dipping the cuttings in water. Allow the cuttings to dry out for a day before setting them in small pots containing a slightly moist equal-parts mixture of peat moss and sand or perlite. It is important not to let the mixture become more than slightly moist; if the potting mixture is too wet, the cuttings will rot before they can produce roots. Place the pots where they can get bright light but without direct sunlight, at normal room temperature. Keep the potting mixture just barely moist, allowing the top two-thirds to dry out between waterings. When rooting occurs (in five to eight weeks), move the young plants into the standard soil-based potting mixture and treat them as mature specimens after they have made around 5cm (2 inch) of top growth. 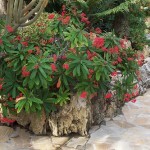 Problems: Euphorbia milii is generally trouble-free. The plants will survive drought conditions, though under extreme drought leaves will drop permanently. Stems that are cold-damaged (soft stems with burned leaves) are likely to rot and should be removed as soon as the damage is evident. Plants should be protected from freezing temperatures. 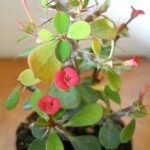 Uses: Euphorbia milii easily develops a hanging habit and is grown in window boxes or terrace planters. The attraction is the bright scarlet-bract flowers which may appear all year. 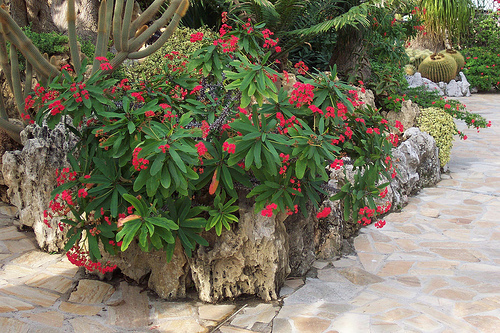 Both salt and drought-tolerant, Euphorbia milii is a valuable addition to tropical gardens. Toxicity: The sap of Euphorbia milii can irritate the sensitive skin; that of some species is poisonous and acrid and it is therefor advisable to place the Euphorbia milii where they are unlikely to be knocked and out of the reach of young children. Euphorbia milii var. hislopii has tick stems armed with 2cm (0.8 inch) long spines; its lance-shaped leaves are 2cm (0.8 inch) long and its red or pink bracts are up to 2cm (0.8 inch) across. Euphorbia milii var. splendens differ from the species in that it can grow 2m tall, its stem are 1-2cm thick and its leaves are more oblong in shape than those of Euphorbia milii.